In June and July 2018, a widely publicised cave rescue successfully extricated members of a junior football team trapped in Tham Luang Nang Non cave in Chiang Rai Province, Thailand. Twelve members of the team, aged eleven to sixteen, and their 25-year-old assistant coach entered the cave on 23 June after football practice. Shortly afterwards, heavy rains partially flooded the cave, trapping the group inside. Group found alive on 2 July; all rescued between 8 and 10 July 2018. Efforts to locate the group were hampered by rising water levels and strong currents, and no contact was made for more than a week. The rescue effort expanded into a massive operation amid intense worldwide public interest. On 2 July, after advancing through narrow passages and muddy waters, British divers John Volanthen and Richard Stanton found the group alive on an elevated rock about 4 kilometres (2.5 mi) from the cave mouth. Rescue organisers discussed various options for extracting the group, including whether to teach them basic diving skills to enable their early rescue, wait until a new entrance was found or drilled, or wait for the floodwaters to subside at the end of the monsoon season months later. After days of pumping water from the cave system and a respite from rain, the rescue teams hastened to get everyone out before the next monsoon rain, which was expected to bring a potential 52 mm (2.0 in) of additional rainfall and was predicted to start around 11 July. Between 8 and 10 July, all of the boys and their coach were rescued from the cave by an international team. The rescue effort involved more than 10,000 people, including over 100 divers, many rescue workers, representatives from about 100 governmental agencies, 900 police officers and 2,000 soldiers, and required ten police helicopters, seven police ambulances, more than 700 diving cylinders, and the pumping of more than a billion litres of water out of the caves. There was one fatality, Saman Kunan, a 37-year-old former Thai Navy SEAL who died of asphyxiation on 6 July while returning to a staging base in the cave after delivering supplies of air. Doi Nang Non, "Mountain of the Sleeping Lady". When viewed from this angle, it is said to resemble a lady lying on her back. Tham Luang Nang Non is a karstic cave complex beneath Doi Nang Non, a mountain range on the border between Thailand and Myanmar. The system is 10 kilometres (6.2 mi) long and has many deep recesses, narrow passages and tunnels winding under hundreds of metres of limestone strata. Since part of the cave system is seasonally flooded, a sign advising against entering the caves during the rainy season (July–November) is posted at the entrance. On Saturday 23 June 2018, a group of twelve boys aged between 11 and 16 from a local junior football team named the Wild Boars and their 25-year-old assistant coach, Ekkaphon Chanthawong, went missing after setting out to explore the cave. According to early news reports, they planned to have a birthday party in the cave after the football practice, and spent a significant sum of money on food, but they refuted this in a news conference after the rescue. The team was stranded in the tunnels by sudden and continuous rainfall after they had entered the cave. They had to leave some food supplies behind when fleeing the rising water. Around 7 p.m., head coach Nopparat Khanthawong (Thai: นพรัตน์ กัณฑะวงษ์) checked his phone, finding about twenty missed calls from parents worried that their children had not come home. Nopparat dialed assistant coach Chanthawong, followed by a number of the boys in quick succession. Eventually, he reached Songpon Kanthawong, a 13-year-old member of the team who mentioned he was picked up after practice, and that the rest of the boys had gone exploring in the Tham Luang caves. The coach raced up to the caves finding abandoned bicycles and bags near the entrance, with water seeping out of the muddy pathway. He alerted authorities to the missing group after seeing their unclaimed belongings. Duangphet Phromthep Dom 13 Team captain. Mongkhon Bunpiam Mark 13 Last to be rescued. Stateless. Natthawut Thakhamsong Tern 14 Rescued in first mission. Adun Sam-on Dul 14 Only English-language speaker; communicated with initial rescue party. Stateless. Prachak Sutham Note 15 Rescued in first mission. Phiphat Phothi Nick 15 Rescued in first mission. Phonchai Khamluang Tee 16 Stateless. Phiraphat Somphiangchai Night 16–17 Celebrated his birthday while in the cave. Ekkaphon Chanthawong Ake 25 Assistant coach and former monk. Stateless. Ninth to be rescued. The assistant coach and three of the boys had no nationality. Nopparat Khanthavong, the founder of the Wild Boars team, explained that they are from tribes in an area that extends across Thailand, Myanmar, Laos, and China. This region has no clear borders and people are not assigned passports. Their statelessness deprived them of basic benefits and rights, including the possibility to leave the Chiang Rai province. "To get nationality is the biggest hope for the boys", Khanthavong said. "In the past, these boys have problems traveling to play matches outside of Chiang Rai because of their nationless status." Following the team's rescue, Thai officials promised to provide the three boys and the coach with legal assistance in obtaining Thai citizenship, a process which they said could take up to six months. On 26 September, the boys and the coach were granted Thai citizenship. British caver Vern Unsworth, who lives in Chiang Rai and has detailed knowledge of the cave complex, was scheduled to make a solo venture into the cave on 24 June when he received a call about the missing boys. Unsworth advised the Thai government to request assistance from the British Cave Rescue Council (BCRC). On 25 June, Thai Navy SEALs divers arrived and began searching the cave. A Thai Navy SEAL said the water was so murky that even with lights they could not see where they were going underwater. After continuous rain, which further flooded the entrance, the search had to be periodically interrupted. On 27 June, three BCRC cave divers arrived with specialist equipment including Heyphone LF radios, followed by separate teams of open water divers. On 28 June, a United States Air Force team of 31st Rescue Squadron Pararescue divers joined them. By 29 June, an Australian Federal Police team of Specialist Response Group divers had arrived and on Sunday a Chinese team of divers from the Beijing Peaceland Foundation. Meanwhile, policemen with sniffer dogs searched the surface above for shaft openings that could provide alternative entrances to the cave system below. Drones and robots were also used in the search, but no technology existed to scan for people deep underground. BCRC divers Richard Stanton and John Volanthen advanced through the cave complex placing diving guidelines, supported by Thailand-based Belgian cave diver Ben Reymenants  and French diver Maksym Polejaka The search had to be suspended due to the weather, as rainfall increased the flow of water in the cave where the divers were battling strong currents and poor visibility. The search resumed on 2 July after the weather improved. The twelve boys and the coach were discovered at approximately 22:00, by Stanton and Volanthen, whose efforts were overseen from outside by BCRC diver Robert Harper. The boys and coach were on a narrow rock shelf about 400 metres (1,300 ft) beyond the "Pattaya Beach" chamber, named after an above-ground beach in Thailand. Volanthen had been placing guidelines in the cave to assist others in navigation when he ran out of line. He then swam to the surface and soon found the missing group, smelling them before hearing or seeing them. The ledge where they were found is about 4 kilometres (2.5 mi) from the cave mouth. A video of the encounter, showing the boys and their interactions with the divers, was posted on Facebook by the Thai Navy SEALs. In the video, the dazed boys are uncertain how long they have been trapped, as they ask the divers what day it is. Former Chiang Rai provincial governor Narongsak Osatanakorn [th], who was in charge of rescue work, said "We found them safe. But the operation isn't over." The Thai, US, Australian and Chinese diving teams supported the BCRC divers began transporting diving bottles into the cave system and established an air supply storage area in Chamber 3. On 3 July the trapped group were joined by three Thai Navy SEALs who supported them until the rescue. The SEALS included Thai Army doctor Lt. Col. Pak Loharachun of the 3rd Medical Battalion, who had completed the Navy SEALs course. Thai officials told reporters that rescuers were providing health checks and treatment and keeping the boys entertained, and that none of those trapped was in serious condition. "They have been fed with easy-to-digest, high-energy food with vitamins and minerals, under the supervision of a doctor", Rear Admiral Apagorn Youkonggaew, head of the Thai Navy's Special Forces, told reporters. A video made by the rescuers, and shared a few hours later by the Thai Navy SEALs, showed all twelve boys and their coach introducing themselves and stating their age. Wrapped in emergency blankets and appearing frail, they all said hello to the outside world. "Sawatdi khrap", each boy said with his palms together in wai, the traditional Thai greeting. A second video shows a medic treating them. It was believed that some of the group could not swim, complicating what would already be a difficult rescue. The Army doctor discovered that they had attempted to dig their way out of the cave. The team members had used rock fragments to dig every day, creating a hole five metres deep. BCRC diver Jason Mallinson offered the boys and coach an opportunity to send messages to relatives by using his wet notes pad. Many of the notes said they were safe, reassured family members that everything was fine, and included words of love, reassurance and encouragement. A logistics camp was established at the cave entrance, which accommodated hundreds of volunteers and journalists in addition to the rescue workers. The site was divided into several zones: restricted areas for the Thai Navy SEALs, other military personnel, and civilian rescuers, an area for the relatives to give them privacy, and areas for the press and for the general public. An estimated 10,000 people contributed to the rescue effort, including more than 100 divers, representatives from about 100 government agencies, 900 police officers, 2,000 soldiers and numerous volunteers. Equipment included ten police helicopters, seven police ambulances, and more than 700 diving cylinders, of which more than 500 were in the cave at any time while another 200 were in the queue to be refilled. More than a billion litres of water (the equivalent of 400 Olympic-size swimming pools) were removed. The point where the boys became stranded was about 4 kilometres (2.5 mi) from the entrance and 800–1,000 metres (2,600–3,300 ft) below the top of the mountain. The route to them had several flooded sections, some with strong currents and zero visibility, and some extremely narrow parts, the smallest measuring only 38 by 72 centimetres (15 in × 28 in). The journey through the cave to the team took six hours against the current and five hours to exit with the current, even for experienced divers. From the outset rescue workers battled rising water levels. In an effort to de-water the cave, a stone diversion dam was built upstream and systems were installed to pump water out of the cave and divert flows that were entering it. On 4 July, it was estimated that the pumps were removing 1,600,000 l/h (420,000 US gal/h) from the cave, ruining nearby farm fields in the process. For a time, well-meaning volunteers inadvertently pumped water back into the groundwater supply. Helped by a spell of unseasonably dry weather, these efforts reduced water levels by 1.5 centimetres (0.6 in) per hour on 5 July, enabling rescue teams to walk 1.5 kilometres (0.93 mi) into the cave. However, heavy rains forecast for 8 July were expected to halt or reverse this process and could even flood the position where the team were trapped. On 6 July, the oxygen level in the cave was detected to have dropped, raising fears that the boys might develop hypoxia if they remained for a prolonged time. By 8 July the oxygen level was measured to be 15%; the level needed to maintain normal function for humans is between 19.5% and 23.5%. Thai military engineers attempted to install an air supply line to the boys, but the effort was abandoned as impractical. Wait until the end of the monsoon season; with divers providing food and water. Teach the group basic diving skills. Find an alternative entrance to the cave which could allow for an easier escape; one shaft was discovered that went down 900 metres. Drill a rescue shaft; more than 100 shafts were bored into the soft limestone, but no suitable location was found. Build a telephone wire to communicate. Multiple dangers—the threat of more heavy rain, dropping oxygen levels, and the difficulty or impossibility of finding or drilling an escape passage—forced rescuers to make the decision to bring out the team and coach with experienced divers. The Thai Navy SEALs and US Air Force rescue experts met with the Thai Minister of the Interior who approved the plan. Ninety divers worked in the cave system, forty from Thailand and fifty from other countries. Rescuers at first considered teaching the boys basic diving skills to enable them to make the journey. Organisers built a mock-up of a tight passage with chairs, and divers practiced with local boys in a school swimming pool. Thai SEALs and US Air Force experts then refined the plan to use teams of divers to bring out the weakened boys. On 5 July at 8.37pm, Saman Kunan (Thai: สมาน กุนัน), a 37-year-old former Thai Navy SEAL, made a dive from Chamber 3 to the T Junction close to Pattaya Beach to deliver three air tanks. During his return he lost consciousness underwater. His dive buddy attempted CPR without success. Kunan was brought to Chamber 3 where CPR was attempted again, but he could not be resuscitated and was pronounced dead about 1 am on 6 July. A member of Thai Navy SEALs class 30, Kunan had left the SEALs in 2006 at the rank of Petty Officer 1st class and was working in security at the Suvarnabhumi Airport when he volunteered to assist the cave rescue. He was posthumously promoted to Lieutenant Commander by the Commander-in-Chief of the Royal Thai Navy, an unprecedented rise of seven ranks. A funeral sponsored and attended by the Thai royal family was held on 14 July. On the same day, he was also awarded the Knight Grand Cross (first class) of the Most Exalted Order of the White Elephant by King Vajiralongkorn. A memorial statue of him may form a part of a proposed tourist attraction at the site. On the morning of 8 July, officials instructed the media and all non-essential personnel around the cave entrance to clear the area as a rescue operation was imminent, due to the threat of monsoon rains later in the week, which were expected to flood the cave until October. 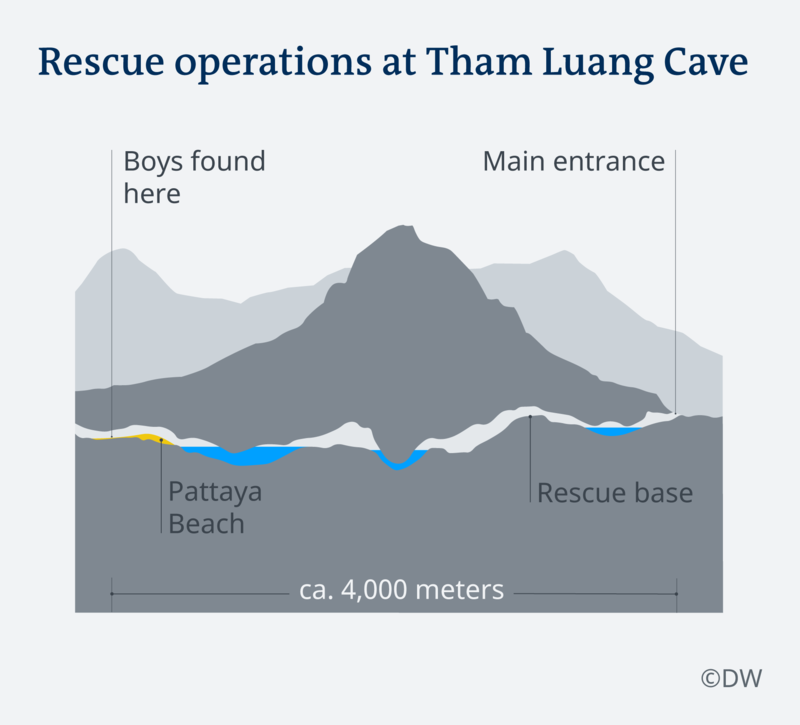 For the first part of the extraction, eighteen rescue divers consisting of thirteen international cave divers and five Thai Navy SEALs were sent into the caves to retrieve the boys, with one diver to accompany each boy on the dive out. There were conflicting reports that the boys were rescued with the weakest first or strongest first. In fact, the order was which boy volunteered first. The international cave diving team was led by four British divers John Volanthen, Richard Stanton, Jason Mallinson, Chris Jewell each assigned a boy and two Australians, Dr Richard Harris, a physician specializing in anesthesia, and Craig Challen. Their portion of the journey would stretch over 1 kilometre going through submerged routes while being supported by 90 Thai and foreign divers at various points performing medical check-ups, resupplying air-tanks for the main divers and other emergency roles. The boys were dressed in a wetsuit, buoyancy jacket, harness and a positive pressure full face mask. A cylinder with 80% oxygen was clipped to their front, a handle attached to their back and they were tethered to a diver in case they were lost in the poor visibility. The rescue divers described them as "a package." Dr Harris administered anaesthetic to the boys before the journey, rendering them unconscious, to prevent them from panicking on the journey and risking the lives of their rescuers. The Thai government provided doctor Harris and two medical assistants with diplomatic immunity if something went wrong. The anaesthetic lasted between 45 minutes to an hour, requiring divers, whom Dr Harris had trained, to re-sedate the boys during the three hour journey. The boys were manoeuvred out by the swimming divers who held onto their back or chest, with each boy on either the right or left side of the diver, depending on the guideline; in very narrow spots divers pushed the boys from behind. The divers navigated them through tight passages carefully to avoid dislodging their full face mask against rocks. The divers kept their heads higher than the boys so that in poor visibility the diver would hit their head against the rocks first. After a short dive to a dry section, the divers and boys were met by three divers, and the boys' dive gear was removed. The boys were then transported on a drag stretcher over 200 m of rocks and sand hills. Craig Challen assessed them, and their dive gear was put back on before they were re-submerged for the next section. The boys arrived at 45 minute intervals. The divers knew the boys were breathing from their exhaust bubbles, which they could see and feel. After being delivered by the divers into the staging base in Chamber 3, the boys were then passed along a 'daisy chain' by hundreds of rescuers stationed along the treacherous path out of the cave. The boys, wrapped in 'sked' stretchers, would alternately be carried, slid and zip-lined over a complex network of pulleys installed by rock-climbers. Many areas from Chamber 3 to the entrance of the cave were still partially submerged and rescuers described having to transport the boys over slippery rocks and through muddy water for hours. The journey from Chamber 3 to the cave entrance took about four to five hours initially, but was reduced to less than an hour after a week of draining and clearing the mud path using shovels. The authorities warned that extracting everyone would take several days, because crews had to replace air tanks, gear, and other supplies, requiring ten to twenty hours between each run. Shortly after 19:00, local officials said that two boys had been rescued and taken to Chiangrai Prachanukroh Hospital. Shortly after, two more boys exited the cave and were assessed by medical officials. Low water levels had reduced the time required for the rescues. The lower water was due to improved weather and the construction of a weir outside the cave to help control the water. On 9 July, four more boys were rescued from the cave. On 10 July, the last four boys and their coach were rescued from the cave. Experience helped streamline the rescue procedure, so the total time to extract a boy was reduced from three hours on the first day to just over two hours on the final day, allowing four boys and the coach to be rescued. The three Thai Navy SEALs and the Army doctor who had stayed with the boys the entire time were the last to dive out. Three of these divers made it to Chamber 3, joining waiting rescuers when the pumps shut off for an uncertain reason, possibly due to a burst water pipe. Water levels in Chamber 3 started to rise, which would have cut off rescuers' access to Chamber 2, Chamber 1 and the entrance of the cave. "All of a sudden a water pipe burst and the main pump stopped working", a diver stated. "We really had to run from the third chamber to the entrance because the water level was rising very quickly – like 50 cm every 10 minutes." This forced up to 100 rescuers still located more than 1.5 kilometres (0.93 mi) inside the cave to evacuate in a hurry, abandoning the rescue equipment inside the cave. The last diver made it back to Chamber 3 as everyone was preparing to leave. The rescuers managed to rush to the cave exit in under an hour. A number of news outlets reported on the role of coach Ekkaphon during the rescue. The coach had previously been a Buddhist monk, and had guided meditation for the children during the ordeal. He also passed on a message in which he apologised for putting the children in danger. Thai authorities said the rescued boys were able to eat rice porridge, but more complex foods would be withheld for ten days. The Thai Health Ministry said the boys lost an average of 2 kilograms (4.4 lb) each, but were in "good condition". The boys were quarantined while health workers determined whether they had caught any infectious diseases, and they were expected to remain hospitalised for at least one week. Due to the prolonged stay in the damp cave environment, officials were worried about potential infections such as histoplasmosis or leptospirosis. Parents of the team members initially visited looking through a window, but if laboratory results proved negative, they would be allowed to visit in person while wearing a medical gown, face mask and hair cap. The boys wore sunglasses as a precaution while their eyes adjusted to daylight. Detailed tests of their eyes, nutrition, mental health and blood were carried out. A Health Ministry physician said all the boys showed an increase in white blood cells, so preventive antibiotic doses were given to the entire team. Residents of Chiang Rai province volunteered to cook, clean for, and otherwise support the missing team's families and the rescue teams at the encampment by the cave mouth. Social media were used to draw attention to the rescue attempts. Classmates and teachers of the team spent time chanting and praying for the missing boys. Classmates of one of the boys made 1,000 paper cranes for him, while praying for his safe return. Local schools donated money to help the parents with living costs, as many of them stopped working in order to follow the rescue attempts. On 29 June, Prime Minister Prayut Chan-o-cha visited the search site and told the families of the boys not to give up hope. Following the death of Saman Kunan, King Rama X announced that he would sponsor Kunan's funeral. After the rescue was completed, the boys' families, the rescue commander, military officials, and the thousands of volunteers gathered at the cave entrance. The group gave thanks for the lives saved and asked forgiveness from the cave goddess "Jao Mae Tham" for the intrusion of pumps, ropes and people during the rescue. Some observers, primarily in Western media, questioned whether assistant coach Ekkaphon Chanthawong should face criminal charges for leading the group into the caves, despite the warning sign at the entrance stating that it is dangerous to enter between July and November. The boys had entered the cave on 23 June, one week before the advised period. Local communities, as well as the boys' parents, emphasised that they did not blame the boys or their coach, as the rain had arrived a month earlier than usual. Vern Unsworth, a British caver mapping the cave, stated, "Nobody’s to blame, not the coach, not the boys. They were just very unlucky ... It wasn’t just the rain that day, the mountain is like a sponge and waters from earlier rain were raising the levels". Unsworth said that he himself had been planning to make a solo venture into the complex on 24 June, when he received a telephone call saying the boys were missing there. While the police chief told the newspaper Khao Sod that he "hadn't ruled out" pressing negligence charges against the coach for putting the team in danger, no calls were made to take legal action against him. A number of lawyers stated that the coach would probably not face criminal charges, since Thai law also takes into consideration whether a person has malicious intent. In mainstream media, Ekkaphon has widely been held 'a hero' and was a "calm voice [that] helped boys to beat despair in the darkness." The coach was reported to have treated the boys with care, giving them his food, helping them remain calm, and instructing them to drink the relatively clean water dripping from the cave walls, instead of the murky floodwaters that trapped them. When asked if Ekkaphon should be held legally responsible for negligence, Mongkhon Bunpiam, the father of 12-year-old Mongkhon, rejected the suggestion: “We would never do that...the boys love their coach...and we as parents don’t want it either. Coach Ekk has been good to my boy, and now I hear how he gave them hope, and kept them calm for so many days without food. I have great admiration for him.” Tanawut Vibulrungruang, father of 11-year old Chanin, was reported to be "touched by the actions of the team's coach. Without him...he doesn't know how the kids could have survived." The team's head coach, Nopparat Kanthawong, said he would not have approved of the hike, but was confident in Ekkaphon's ability to take care of the boys. Prime minister Prayut Chan-o-cha said that the emphasis should be on the rescue and the recovery of the team, and he asked the public to avoid a rush to judgment. Over the course of two weeks, hundreds of volunteers, military specialists and corporate experts arrived from around the world to offer assistance in the rescue. Australia: Six Australian Federal Police (AFP) Specialist Response Group divers, one Navy Clearance diver, one Australian Medical Assistance Team (AUSMAT) member and Department of Foreign Affairs and Trade Crisis Response Team officers. Up to 20 Australians were involved at the cave site. Doctor Richard Harris, an anaesthetist, was part of the medical team that determined the boys' fitness to make the 4-kilometre (2.5 mi) journey. Harris and his diving partner, retired veterinarian Doctor Craig Challen, both cave diving specialists, played key roles in the rescue. The Thai government provided Harris with diplomatic immunity to protect him in case anything went wrong with the sedation. Belgium: Ben Reymenants, the owner of a diving school in Phuket, contributed in cave diving capacity. Canada: Erik Brown, a dive instructor from Vancouver, participated on the cave diving team. China: A six man team from the volunteer rescue organisation the Beijing Peaceland Foundation arrived on 29 June. The team brought rescue equipment including an underwater robot, diving equipment and a three-dimensional imager. A second Chinese team arrived on 30 June from the Green Boat Emergency Rescue organisation with expertise in search and rescue on mountains and in caves. Czech Republic: Government of the Czech Republic offered to provide a Czech manufacturer's high performance pumps; the state has four such pumps, each with an output of 400 litres per second (1,440,000 l/h (380,000 US gal/h)). Upon inspection at the site, however, it was determined heavy-duty pumps could not be used due to unsuitable terrain. Denmark: Two Danish divers, Ivan Karadzic who runs a diving center with Finnish Mikko Paasi, and Claus Rasmussen, a diving instructor, participated in the cave diving team. Finland: Diver Mikko Paasi came to assist with rescue efforts. France: Diver Maksym Polejaka assisted with the rescue efforts. Ireland: Diver Jim Warny assisted with the rescue efforts. India: Experts from Kirlosker Brothers' Limited's (KBL) offered technical know-how and advice on dewatering and pumps. Israel: Diver Rafael Aroush joined the diving team while emergency mobile communication devices were donated by Maxtech NetWorks. 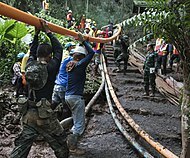 Japan: Divers and engineers, including Shigeki Miyake, a drainage specialist of the Japan International Cooperation Agency in Thailand, assisted in efforts to pump water out of the cave. Laos: Members of the Vientiane Rescue contributed to search and rescue efforts. Netherlands: Drainage specialists were sent to aid water pumping efforts. Russia: Ministry of Emergency Situations ready to sent a volunteer team including a rescue specialist. Ukraine: Divers Vsevolod Korobov and Maksym Polejaka came to assist with rescue efforts. United Kingdom: The British Cave Rescue Council sent eight experienced cave rescue divers, some familiar with caves in Thailand, to lead the diving team; three cave rescue personnel; and special equipment. Vernon Unsworth, a British man living in the area, was the first person with caving expertise on the site. John Volanthen and Rick Stanton discovered the boys and led the cave diving team. Chris Jewell and Jason Mallison brought 500 kilograms (1,100 lb) of diving equipment. Other divers involved included Connor Roe and Josh Bratchley. Other cave rescue personnel, Mike Clayton, and Gary Mitchell provided surface control for the divers, along with Robert Harper who had initially deployed among the first three U.K. divers. Tim Acton deployed as a friend of the Thai Navy SEAL's. United States: On 28 June, the US military’s Indo-Pacific Command (USINDOPACOM) deployed 36 personnel from Okinawa, including airmen from 353rd Special Operations Group and the 31st Rescue Squadron. According to Military.com, they joined seven other personnel, including a member of Joint US Military Advisory Group Thailand. Pentagon spokesman Colonel Rob Manning said that US personnel had "staged equipment and prepared the first three chambers of the cave for safe passage. The US contingent assisted in transporting the evacuees through the final chambers of the system, and provided medical personnel and other technical assistance to the rescue efforts." Volunteers, teams and technical specialists from countries including Germany, Myanmar, the Philippines, Singapore, Spain, Sweden, and Ukraine, also participated in the operation. France offered to send a team of specialists and equipment, but Thai authorities believed that adequate resources were already on site. The ordeal captured the media's attention from around the world. Over a period of three weeks, articles relating to the incident dominated the top stories section at many major news publications. Tesla chief executive Elon Musk contacted James Yenbamroong, CEO of Thailand-based satellite company mu Space Corp, to get him connected with the Thai government. He then ordered engineers from two of his companies to design a "kid-sized" submarine to help the rescue effort. Thai authorities decided not to use the submarine. FIFA, via a letter from its president Gianni Infantino to the president of the Football Association of Thailand, invited the children and coach to the World Cup final if circumstances allowed. The entire team was expected to remain hospitalised for at least a week, and watched the final on television instead. FC Barcelona invited the team to play in their international academy tournament in 2019 and to watch a first-team game at their home stadium Camp Nou. England and Manchester City F.C. defender Kyle Walker said he wanted to send them shirts, after spotting that one of the rescued boys was wearing a "Three Lions" jersey. In October 2018 the boys traveled to the UK as guests at Old Trafford for the Manchester United F.C. home match against Everton F.C. in the Premier League. The boys were invited by the IOC to the opening ceremony of the 2018 Summer Youth Olympics in Buenos Aires. 23 June: The team entered the Tham Luang cave shortly after practice and prior to heavy rain. Later, the mother of one of the boys reported to local police that her son was missing after he failed to arrive home. Local police investigated and found shoes and bicycles near the entrance of the cave after rumors spread about them going into the Tham Luang cave. 24 June: Handprints and footprints of the boys were found by officials. A vigil is held outside the cave by relatives. 25 June: Thai Navy SEAL divers enter the cave to search for the team. 26 June: Having arrived at a T-junction, divers were pushed back due to floodwaters. The floodwaters blocked an elevated air pocket near Pattaya Beach, where divers believe the team may have been stranded. 27 June: British and a US military team of divers and experts were sent to Thailand to help with the search. Divers re-entered but quickly retreated due to another flooding. 28 June: Heavy rains caused the rescue operation to stop temporarily. In order to drain the water, pumps were delivered. Drones were dispatched to assist more than 600 people in search of new vents in the cave roof. 29 June: Thai Prime Minister Prayut Chan-o-cha visited the site. 30 June: The search resumed after divers took advantage of a brief pause in the rainfall. They advanced further, but still were far from where they believed the boys might be stranded. 1 July: As divers went deeper into the cave, they used Chamber 3 as an operating base to store diving cylinders and other supplies which were replenished by support divers transiting back and forth to the entrance. 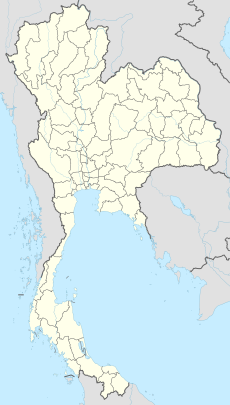 2 July: The team were found alive on elevated land in the evening at around 20:20 by the British diving team, including Richard Stanton and John Volanthen, 400 m (1,300 ft) further than Pattaya Beach. Communication was difficult since only Adun spoke English. 3 July: Seven Thai Navy divers, including Doctor Pak Loharnshoon and a medic, went to deliver food, medicine and supplies to the boys, including high calorie gels and paracetamol. Four of them, including Loharnshoon, volunteered to stay with the boys inside the cave for a week until all 12 were extracted. They would be the last people to exit the cave. 4 July: The team were taught how to use a full face diving mask and breathing apparatus as none of the boys knew how to swim. Rescue teams worked on continuing to pumping water from the cave, they had already pumped out over 30 million gallons. 5 July: The rescue was forced to move more quickly due to expected rain. Another group searched the mountains for any new cracks or openings. 6 July: Saman Kunan, a former Thai navy diver and volunteer of the rescue mission, died between 01:00 to 02:00 after losing consciousness while placing diving cylinders underwater along the route to the stranded boys. Authorities urged that the rescue happen faster, due to oxygen levels falling to 15%, well below the 21% "safe zone." 7 July: The rescue chief claimed that it was not suitable for the team to dive yet. More than 100 vents were being drilled in a third attempt to reach the team. However, an accident to a rescue vehicle injured six people, and the effort was called off. A letter appeared from the coach of the team, apologising to the boys' parents along with letters from the boys to their parents. 8 July: Thirteen international divers, led by four British and two Australian divers, and five Thai military SEALs divers went into the cave to begin bringing the boys to safety. The boys were each to be accompanied by 3 divers as they made their way out of the cave. The boys were also sedated to prevent any panic. The first boy was reported to have come out about 17:40, and the fourth one was reported to have exited about 19:50, though not all sources agree. The four boys were taken to Chiang Rai Prachanukroh, a local hospital. It was announced that divers would not resume the rescue for at least another 10 hours, as they needed to replenish supplies. 9 July: Four more boys were confirmed to be out of the cave and then taken to the hospital. It was also announced that the boys would be kept in quarantine. 10 July: The remaining four boys and their coach were rescued. It was later confirmed that all of the rescue divers had also successfully exited the cave. The Wild Boars with Thomas Bach at the 2018 Summer Youth Olympics. The head of the rescue mission and former governor of Chiang Rai province, Narongsak Osatanakorn [th], said that the cave system would be turned into a living museum to highlight how the operation unfolded. Prime Minister Prayut Chan-o-cha acknowledged the statement but highlighted the concerns for tourist safety, stating that precautions would have to be added and correctly implemented both inside and outside to safeguard tourists. Following the incident, Thailand's Navy SEALs will include cave-diving in their training regimen to be better prepared for similar emergencies. Three of the boys and their assistant coach were stateless, and officials promised that they would be granted Thai citizenship within six months. On 26 September, the four were granted Thai citizenship. The Thai government has vowed to end statelessness by 2024. On 10 July, a managing partner of US film production company Pure Flix announced that the firm was planning to create a feature film based on the rescue, with potential for worldwide release. Ivanhoe Pictures of SK Global Entertainment also expressed interest in a separate project, with Jon Chu slated as the director. A film, called The Cave, is currently being filmed by Thai-Irish filmmaker Tom Waller, featuring many of the real-life cave divers as themselves. Australia: On 24 July 2018, the Governor-General of Australia awarded the Bravery Medal to the six AFP Special Response Group divers and the Navy Clearance diver who supported the diving operation in the cave for having "displayed considerable bravery". Cave divers Doctor Richard Harris and Craig Challen were awarded the Star of Courage for "displayed conspicuous courage". All nine were awarded the Medal of the Order of Australia (OAM) "for service to the international community through their specialist response roles". On 25 January 2019, Challen and Harris were named Australians of the Year. China: On 18 July 2018, the Thai Ambassador to Beijing hosted a luncheon for the Beijing Peaceland Foundation and Green Boat Emergency Rescue organisation. Thailand: On 13 July 2018, the Commander-in-Chief of the Royal Thai Navy (C-in-C), in a letter of commendation, posthumously promoted to lieutenant commander former Navy SEAL Saman Kunan, who had died on 6 July, and on 14 July the King of Thailand awarded him with the Knight Grand Cross of the Most Exalted Order of the White Elephant. Commander of the Navy SEALs, Rear Admiral Apakorn Youkongkaew, and Navy SEAL Special Captain Anan Surawan, Commander of the First Special Warfare Corps, were cited in the letter of commendation by the C-in-C for their "outstanding performance, which sets the best example for others in the Thai navy to follow". RADM Youkongkaew had commanded the overall activities of all divers during the operation and CAPT Surawan had commanded the operational center in Chamber 3. The commendation stated that 127 current and former Navy SEAL members and a 32 member medical team had participated in the rescue. United Kingdom: On 24 July 2018, the Prime Minister hosted a reception at 10 Downing Street with the Thai Ambassador for the British Cave Rescue Council divers and personnel involved in the rescue. On 7 September 2018 the Royal Thai government hosted a reception for all Thai and foreign officials and personnel involved in the rescue. His Majesty the King granted a royal decoration, The Most Admirable Order of the Direkgunabhorn, to 188 people who were involved in the rescue of the football team—114 foreigners and 74 Thais. The Royal Thai Government Gazette has officially published the list of recipients of the Order of the Direkgunabhorn for Tham Luang cave rescue on 21 March 2019. In November 2018, the British cave rescue team were given the Pride of Britain 2018 award for "Outstanding Bravery". The rescued children attended the award ceremony, in London. Stanton, Volanthen, Harris, Mallinson and Jewell were the first ever recipients of the Medal of Valor from the Professional Association of Diving Instructors, an American organisation. On 28 December 2018 seven British members of the rescue team were honoured in the 2019 New Year Honours. Stanton and Volanthen each received the George Medal; Jewell and Mallinson received the Queen's Gallantry Medal; and Josh Bratchley, Connor Roe and Vern Unsworth were appointed Members of the Order of the British Empire. On 5 January 2019, the Asian Football Federation awarded the Wild Boars a two-year support program, which will provide the club with technical support and training equipment and 100 Molten match balls a year. Three of the boys and their coach were invited to the 2019 AFC Asian Cup in United Arab Emirates to watch Thailand vs. India match on January 6, 2019 as guests of honor. ^ Safi, Michael; Thoopkrajae, Veena (8 July 2018). "Thailand cave rescue begins as four of 12 boys freed in day of drama". The Guardian. Archived from the original on 8 July 2018. Retrieved 9 July 2018. ^ "Former Thai Navy SEAL dies in rescue operation for soccer team trapped in cave". MassLive. 6 July 2018. Archived from the original on 8 July 2018. Retrieved 8 July 2018. ^ a b c Staff (10 July 2018). "Thailand cave rescue: all 12 boys and coach successfully rescued – live – Three Thai navy divers and medic remain in cave at close of operation in northern Thailand – 08:06 am/et/usa". The Guardian. Archived from the original on 10 July 2018. Retrieved 10 July 2018. ^ a b c Neumann, Scott; Chappell, Bill (10 July 2018). "All 12 Boys And Their Coach Are Rescued From Thai Cave, After 2 Weeks". NPR. Archived from the original on 10 July 2018. Retrieved 10 July 2018. ^ a b c Staff (10 July 2018). "Thai Cave Live Updates: All 13 Are Free After Weeks of Ordeal – 08:24 am/et/usa". The New York Times. Archived from the original on 10 July 2018. Retrieved 10 July 2018. ^ "Diver dies in Thailand cave rescue attempt". BBC News. 6 July 2018. Archived from the original on 6 July 2018. Retrieved 6 July 2018. ^ "Thailand cave rescue: Boys appear in new video, 'I am healthy'". CNN. 4 July 2018. Archived from the original on 4 July 2018. ^ "Monsoon rains could damper rescue efforts to save soccer team in Thailand cave". ABC News. 5 July 2018. ^ McKirdy, Euan; Olarn, Kocha; Berlinger, Joshua. "Thai rescue: Hopes high 4 boys, coach will be freed from cave Tuesday". CNN. Archived from the original on 10 July 2018. Retrieved 10 July 2018. ^ Chris Peterman (22 July 2018). "Risky Thailand cave rescue relied on talent, luck—and on sticking to the rules". Ars Technica. Retrieved 23 July 2018. ^ a b c Solomon, Feliz. "Why It's So Hard to Rescue the Thai Team Trapped in a Cave". Time. Archived from the original on 3 July 2018. Retrieved 2 July 2018. ^ เอกพล จันทะวงษ์ on Facebook. ^ a b "Five things we learned from Thai boys' news conference". 18 July 2018. Retrieved 28 October 2018 – via www.bbc.com. ^ a b Olarn, Kocha; Said-Moorhouse, Lauren (3 July 2018). "Thai cave rescue: Soccer team found alive one kilometer underground". CNN. Archived from the original on 3 July 2018. Retrieved 3 July 2018. ^ Safi, Michael (5 July 2018). "Left behind: the two Thai boys who missed out on disastrous cave trip". The Guardian. Archived from the original on 9 July 2018. Retrieved 9 July 2018. ^ a b c Staff (8 July 2018). "Thai cave rescue: Four boys freed but rest must wait". BBC News. Archived from the original on 8 July 2018. Retrieved 8 July 2018. ^ a b "Four more boys rescued from Thai cave". BBC. 9 July 2018. Archived from the original on 10 July 2018. Retrieved 10 July 2018. ^ Mahtani, Shibani (7 July 2018). "'He loved them more than himself': How a 25-year-old former monk kept the Thai soccer team alive". The Washington Post. ^ "How a 25-year-old ex-monk kept the Thai cave boys alive – and won the hearts of their parents". South China Morning Post. 8 July 2018. Retrieved 12 July 2018. ^ a b c d "Who are the Thai boys who were trapped in a cave?". BBC News. 11 July 2018. Retrieved 12 July 2018. ^ a b c d "Statelessness a Hurdle for Some Boys Rescued From Thai Cave". Khaosod English. Associated Press. 17 July 2018. ^ a b "Thai cave rescue – first four boys saved pictured as eight teammates and coach forced to wait another day". The Sun. 8 July 2018. ^ a b c hermesauto (13 July 2018). "Thai cave rescue: Stateless survivors to get help to become Thai citizens". straitstimes.com. Retrieved 14 July 2018. ^ "Thailand Cave Rescue Live Updates: 3 Boys and Coach Are Out, 9 to Go". The New York Times. ^ "British diver heroes describe moment they found Thai boys alive". Mail Online. Retrieved 21 July 2018. ^ Bacon, John. "Video shows rescued Thai soccer players waving to parents, loved ones". USA Today. Retrieved 12 July 2018. ^ a b "'Stateless' Thai boys and coach to be given citizenship after cave rescue". The Independent. Retrieved 13 July 2018. ^ a b "Thai cave rescue: stateless boys and coach granted citizenship". The Guardian. 9 August 2018. ^ a b Wright, Rebecca; Clarke, Hilary (15 July 2018). "British diver recalls Thai cave rescue: 'Are we heroes? No'". CNN. Retrieved 19 July 2018. ^ a b "British cave rescue diver involvement in the Luang Nang Non, cave rescue incident, Thailand" (Press release). British Cave Rescue Council. 28 June 2018. Retrieved 19 July 2018. ^ "Timeline of young footballers, coach being trapped in Mae Sai cave, Chiang Rai". Thai PBS. 25 June 2018. Retrieved 19 July 2018. ^ Vejpongsa , Tassanee (26 June 2018). "Flooding complicates cave search for Thai soccer team". The Washington Post. AP. Archived from the original on 26 June 2018. ^ "Search Suspended for Boys in Flooded Cave in Thailand". The Weather Channel. Archived from the original on 29 June 2018. Retrieved 2 July 2018. ^ "British divers join rescue effort at Thai cave for football team". The Daily Telegraph. 28 June 2018. Archived from the original on 30 June 2018. Retrieved 2 July 2018. ^ Leoni, Victoria (5 July 2018). "US airmen assisting with rescue of stranded Thai soccer team". AIr Force Times. Retrieved 19 July 2018. ^ "Update: AFP statement on Thai cave rescue" (Press release). Australian Federal Police. 5 July 2018. Retrieved 19 July 2018. ^ a b "Chinese Experts Joining Search and Rescue of Teenage Football Team of Thailand" (Press release). Embassy of The People's Republic of China in The Kingdom of Thailand. 29 June 2018. Retrieved 19 July 2018. ^ "Drones, dogs, drilling and desperation". BBC. 30 June 2018. Archived from the original on 2 July 2018. ^ "British divers Richard Stanton and John Volanthen at the heart of the Thai cave rescue". 4 July 2018. Retrieved 22 July 2018 – via www.thetimes.co.uk. ^ a b "Update on the cave search and rescue operation in Tham Luang Nang Non Cave, Thailand" (Press release). British Cave Rescue Council. 2 July 2018. Retrieved 19 July 2018. ^ Pond, Matt (7 July 2018). "CAVE MAN: Phuket diver Ben Reymenants relives four days in Tham Luang cave rescue mission". The Phuket News. ^ a b Richard Harris (13 July 2018). "Facebook post with photo". Retrieved 20 July 2018 – via Facebook. ^ coconutsbangkok (5 July 2018). "French diver explains difficulties ahead as trapped team faces 'race against water' | Coconuts Bangkok". Coconuts. Retrieved 3 April 2019. ^ Com, The Phuket News (18 October 2018). "Hero behind the scenes - Interview with cave diver, Maksym Polejaka". The Phuket News Com. Retrieved 3 April 2019. ^ Aronson, Marc (19 March 2019). Rising Water: The Story of the Thai Cave Rescue. Simon and Schuster. ISBN 9781534444133. ^ "CAVE MAN: Phuket diver Ben Reymenants relives four days in Tham Luang cave rescue mission". Samui Times. 8 July 2018. Retrieved 3 April 2019. ^ "Путь в темноту: как украинцы спасали детей из пещеры в Таиланде". 4 July 2018. Retrieved 3 April 2019. ^ a b c d e f g h i j k l m Mark Willacy (Reporter); Lucy Carter (Producer); Jeanavive McGregor (Producer); Sarah Ferguson (presenter) (16 July 2018). Out Of The Dark. Four Corners (Television production). Australian Broadcasting Corporation. Retrieved 20 July 2018. ^ "Update on the cave search and rescue operation in Tham Luang Nang Non Cave, Thailand" (Press release). British Cave Rescue Council. 2 July 2018. ^ a b c d "Missing Thai boys 'found alive' in caves". BBC News. 2 July 2018. Archived from the original on 2 July 2018. Retrieved 2 July 2018. ^ a b Smith, Nicola (5 July 2018). "Hero diver heads back to Britain as rescuers race to drain water inside Thai cave". The Telegraph. ISSN 0307-1235. Retrieved 13 July 2018. ^ Mackintosh, Eliza (9 July 2018). "Parents of trapped Thai boys haven't been told if their children were rescued". CNN. Archived from the original on 9 July 2018. Retrieved 9 July 2018. ^ Roy, Eleanor Ainge (3 July 2018). "British divers at heart of Thai cave rescue among best in world". The Guardian. Archived from the original on 3 July 2018. Retrieved 3 July 2018. ^ "Thailand cave rescue: Children found 'by smell'". BBC News. 13 July 2018. Retrieved 14 July 2018. ^ Paddock, Richard C.; Suhartono, Muktita (3 July 2018). "Thailand Cave Rescue Turns to How to Extract Trapped Soccer Team". The New York Times. Archived from the original on 3 July 2018. Retrieved 4 July 2018. ^ a b "How the Thai cave rescue mission unfolded". South China Morning Post. 12 July 2018. Retrieved 12 July 2018. ^ Wongcha-um, Panu (3 July 2018). "Found alive on 10th day, Thai boys' cave ordeal not over". Reuters. Archived from the original on 3 July 2018. Retrieved 3 July 2018. ^ "Thai NavySEAL". Archived from the original on 3 July 2018. Retrieved 2 July 2018 – via Facebook. ^ "Thai official says all 12 boys and their coach found alive in cave where they went missing". Los Angeles Times. Associated Press. Archived from the original on 2 July 2018. Retrieved 2 July 2018. ^ "Coming home: Thai boys found alive in caves as Brits help out". Metro. Retrieved 10 July 2018. ^ "Breakthrough in the cave search and rescue operation in Tham Luang Nang Non Cave, Thailand". British Cave Rescue Council. 2 July 2018. Retrieved 19 July 2018. ^ "Mission accomplished: All Tham Luang survivors safely rescued". Thai PBS. 10 July 2018. Retrieved 19 July 2018. ^ a b "Cave hero praises Wild Boars, coach". Bangkok Post. 16 July 2018. Retrieved 19 July 2018. ^ "Video shows stranded Thai boys smiling with rescuer in cave". ABC 7. 4 July 2018. Archived from the original on 8 July 2018. Retrieved 8 July 2018. ^ "Trapped Thai Soccer Team Sends a Message From the Cave". Time. Archived from the original on 5 July 2018. Retrieved 4 July 2018. ^ "Diver dies in Thailand cave rescue attempt". BBC News. 6 July 2018. Archived from the original on 7 July 2018. Retrieved 8 July 2018. ^ "'Don't worry', Thai boys write from cave". BBC News. 7 July 2018. Archived from the original on 7 July 2018. Retrieved 7 July 2018. ^ a b Cheung, Helier (6 July 2018). "Thai cave boys unite community in hope". BBC News. Archived from the original on 6 July 2018. Retrieved 6 July 2018. ^ Dvorak, Phred; Watts, Jake Maxwell (11 July 2018). "The Thai Cave Rescue, Before Its Triumph, Teetered on the Brink of Disaster". The Wall Street Journal. Retrieved 19 July 2018. ^ Beech, Hannah; Paddock, Richard C.; Suhartono, Muktita (12 July 2018). "'Still Can't Believe It Worked': The Story of the Thailand Cave Rescue". The New York Times. Retrieved 12 July 2018. ^ a b Safi, Michael (5 July 2018). "Thai cave rescue: army drains site in bid to free boys before monsoon". The Guardian. Archived from the original on 5 July 2018. Retrieved 5 July 2018. ^ Reymenants, Ben (3 July 2018). "Thailand cave rescue: medics reach boys". The Guardian (live updates). Archived from the original on 2 July 2018. Retrieved 3 July 2018. ^ Reynolds, Emma (10 July 2018). "How first eight were rescued from Thai cave". news.com.au. Retrieved 11 July 2018. ^ a b c "How might the trapped Thai boys be rescued?". BBC News. 4 July 2018. Retrieved 5 July 2018. ^ "Thai boys 'can walk but can't dive yet'". BBC News. 6 July 2018. Archived from the original on 6 July 2018. Retrieved 6 July 2018. ^ a b "Thai cave rescue: 12 boys and coach to get 4 months' food, diving training". The Straits Times. 3 July 2018. Retrieved 3 July 2018. ^ George, Steve; Olarn, Kocha. "Thailand cave rescue: Search teams unsure how to free boys". CNN. Archived from the original on 5 July 2018. Retrieved 6 July 2018. ^ hermesauto (5 July 2018). "Thai cave rescue: Farmers happy even though fields ruined to help clear exit for trapped boys". The Straits Times. Archived from the original on 6 July 2018. Retrieved 6 July 2018. ^ "Thailand cave rescue: Volunteers inadvertently pumped water back into tunnels". USA Today. Archived from the original on 5 July 2018. Retrieved 5 July 2018. ^ Staff (5 July 2018). "Thailand cave: Rescuers in race against weather as rains close in". BBC News. Archived from the original on 5 July 2018. Retrieved 5 July 2018. ^ Scutti, Susan. "How a lack of oxygen is affecting the Thai soccer team". CNN. Archived from the original on 8 July 2018. Retrieved 8 July 2018. ^ Bressan, David. "Why Hydrogeology Plays Such An Important Role In The Thailand Cave Rescue Operations". Forbes. Retrieved 11 July 2018. ^ Viswanathan, Radhika; Barclay, Eliza (7 July 2018). "The 4 risky options to rescue the Thai boys trapped in a cave, explained – The boys may have to swim out of the cave, accompanied by a "buddy" expert diver". Vox. Archived from the original on 7 July 2018. Retrieved 7 July 2018. ^ "Thai boys 'could be in cave for months'". BBC News. 3 July 2018. Archived from the original on 3 July 2018. Retrieved 3 July 2018. ^ "Thai rescuers search for other entrances to flooded cave". The Washington Post. Archived from the original on 5 July 2018. Retrieved 5 July 2018. ^ Staff (6 July 2018). "Inside the Thai Cave: How Rescuers Are Trying to Save a Soccer Team – interactive". The New York Times. Archived from the original on 8 July 2018. Retrieved 8 July 2018. ^ a b Mahtani, Shibani; Hendrix, Steve; McLaughlin, Timothy (13 July 2018). "'Time is running out': Inside the treacherous rescue of boys trapped in a Thai cave". The Washington Post. Retrieved 15 July 2018. ^ "Four Thai boys rescued but rest must wait". BBC News. 8 July 2018. Archived from the original on 8 July 2018. Retrieved 10 July 2018. ^ a b Ives, Mike; Paddock, Richard C.; Suhartono, Muktita (6 July 2018). "Thai Cave Rescue Will Be a Murky and Desperate Ordeal, Divers Say". The New York Times. Archived from the original on 7 July 2018. Retrieved 8 July 2018. ^ "มาย ฮีโร่ "จ่าแซม" จ.อ.สมาน กุนัน สุดยอดนักกีฬาผจญภัย" ["Hero Sam", the adventurous athlete.]. Tnews (in Thai). 7 July 2018. Retrieved 22 July 2018. ^ a b c "Retired SEAL member dies in Tham Luang rescue operation". Thai PBS. 6 July 2018. Retrieved 21 July 2018. ^ Cochrane, Liam; Vimonsuknopparat, Supattra (7 July 2018). "Thai cave rescue: Former Navy SEAL working to rescue boys dies from lack of oxygen". ABC News. Australian Broadcasting Corporation. Retrieved 21 July 2018. ^ a b "'We won't let his life be in vain': Tributes pour in for Thai diver who died trying to save boys in cave". Channel NewsAsia. Reuters/CNA/gs(aj). 6 July 2018. Retrieved 21 July 2018. ^ a b c d "Navy chief praises Thai Navy SEALs in special citation". Thai PBS. 22 July 2018. Retrieved 25 July 2018. ^ a b c "Ex-Seal Saman posthumously promoted". Bangkok Post. 14 July 2018. Retrieved 21 July 2018. ^ Khamthita, Theerawat (13 July 2018). "National aritst to build statue of ex-Navy seal". Bangkok Post. ^ Fernando, Gavin (11 July 2018). "Thai cave could be turned into a tourist attraction and Hollywood film". news.com.au. ^ "Key phase of the rescue operation to bring the boys out of Tham Luang Nang Non Cave begins" (Press release). British Cave Rescue Council. 8 July 2018. Retrieved 4 August 2018. ^ a b "Thailand rescue: Divers start mission to free boys trapped in cave". CNN. 8 July 2018. Retrieved 13 July 2018. ^ a b Zimmerman, Josh (15 July 2018). "Thai cave rescue: Perth hero diver Craig Challen speaks on life and death mission". The Sunday Times. PerthNow. Archived from the original on 14 July 2018. Retrieved 6 August 2018. ^ a b c "A tense but joyful outcome for the cave rescue at Tham Luang Nang Non Cave" (Press release). British Cave Rescue Council. 10 July 2018. Retrieved 13 July 2018. ^ hermesauto (9 July 2018). "Thai cave rescue: Four more boys rescued, health of five remaining in cave 'still good'". The Straits Times. Retrieved 16 July 2018. ^ a b c Rick Stanton gives incredible account of Thai cave rescue. ITV News (Television production). 17 July 2018. Retrieved 4 August 2018. ^ a b John Volanthen interviewed on BBC Points West - 13th July 2018. BBC Points West (Television production). 17 July 2018. Retrieved 4 August 2018. ^ "Thailand cave rescue: Diving expert explains the dangers of trying to lead the children to safety?". The Independent. Archived from the original on 4 July 2018. Retrieved 6 July 2018. ^ a b Thepgumpanat, Panarat (16 July 2018). "Thailand gave diplomatic immunity to Australian medical team in cave rescue". Reuters. Retrieved 19 July 2018. ^ Willacy, Mark; Carter, Lucy (15 July 2018). "Thai cave rescue: Australian diver Craig Challen confirms boys and coach heavily sedated for rescue mission". Four Corners. Australian Broadcasting Corporation. Retrieved 19 July 2018. ^ "First hospital video emerges of Thai boys". BBC News. 11 July 2018. Retrieved 11 July 2018. ^ Eacott, Alina. "Thai cave doctor trained divers how to administer dangerous sedative to kids". ABC News. Australian Broadcasting Corporation. Retrieved 4 August 2018. ^ a b Zimmerman, Josh (15 July 2018). "Aussie diver Craig Challen reveals his fears for boys in Thai cave rescue: 'It was life and death'". The Daily Telegraph. Retrieved 6 August 2018. ^ a b "Last boy was out – but hero cave divers were still in deep water". South China Morning Post. Retrieved 16 July 2018. ^ ""This is madness": A rescue diver on what it was like to save the Thai boys in the cave". Vox. Retrieved 16 July 2018. ^ "'If those were my boys, what would I do? ', S'porean rescue diver's first thoughts at Thai cave". TODAYonline. Retrieved 16 July 2018. ^ "Thailand Cave Rescue Live Updates: Four Boys Are Out, 9 to Go". The New York Times. 8 July 2018. Archived from the original on 8 July 2018. Retrieved 8 July 2018. ^ Lyons, Kate; Busby, Mattha (8 July 2018). "Thailand cave rescue: navy Seals confirm four boys have been rescued – live". The Guardian. Archived from the original on 8 July 2018. Retrieved 8 July 2018. ^ George, Steve. "Thai rescue: Divers start mission to free boys trapped in cave". CNN. Archived from the original on 8 July 2018. Retrieved 8 July 2018. ^ a b (now), Mattha Busby; (earlier), Kate Lyons; Safi, Michael (8 July 2018). "Thailand cave rescue: first two boys brought out, local official tells Reuters – live". The Guardian. ISSN 0261-3077. Archived from the original on 8 July 2018. Retrieved 8 July 2018. ^ "First boys 'rescued from Thailand cave'". BBC News. Archived from the original on 8 July 2018. Retrieved 8 July 2018. ^ Doubek, James (8 July 2018). "Report: 2 Of 12 Boys Rescued From Cave In Thailand". NPR News. Archived from the original on 8 July 2018. Retrieved 8 July 2018. ^ "Thai Cave Rescue Live Updates: 8th Person Is Out". The New York Times. Archived from the original on 10 July 2018. Retrieved 10 July 2018. ^ "Further progress on the rescue operation to bring the boys out of Tham Luang Nang Non Cave" (Press release). British Cave Rescue Council. 9 July 2018. ^ "A tense but joyful outcome for the cave rescue at Tham Luang Nang Non Cave". British Cave Rescue Council. 10 July 2018. Retrieved 4 August 2018. ^ Paddock, Richard C. (10 July 2018). "How Rescuers Pulled Off the Impossible in a Treacherous Thai Cave". The New York Times. Retrieved 10 July 2018. ^ a b c "Final group was pulled from Thai cave just before water pump malfunction". CBS News. 11 July 2018. Retrieved 6 August 2018. ^ a b Safi, Michaal (14 July 2018). "'We don't know how it worked': the inside story of the Thai cave rescue". The Guardian. Retrieved 17 July 2018. ^ a b Safi, Michael (11 July 2018). "Thai cave rescue: water pumps failed just after last boy escaped". the Guardian. Retrieved 12 July 2018. ^ Mahtani, Shibani (7 July 2018). "'He loved them more than himself': How a 25-year-old former monk kept the Thai soccer team alive". The Washington Post. Archived from the original on 9 July 2018. ^ "How coach Chanthawong helped trapped Thai boys survive inside the cave". The Times of India. Associated Press. 9 July 2018. Archived from the original on 9 July 2018. ^ "Cave divers ready to rescue last five". BBC News. 9 July 2018. Archived from the original on 9 July 2018. Retrieved 9 July 2018. ^ "Thai cave rescue: Boys lost two kilograms during weeks in cave". CNN. 11 July 2018. Retrieved 11 July 2018. ^ McKirdy, Euan (9 July 2018). "Thai rescue: Hopes high 4 boys, coach will be freed from cave Tuesday". CNN. Archived from the original on 10 July 2018. Retrieved 9 July 2018. ^ Tanakasempipat, Patpicha. "Mammoth medical operation awaits trapped Thai cave boys". Reuters. Retrieved 11 July 2018. ^ a b Safi, Michael (10 July 2018). "Thai cave rescue operation ends with all 12 boys safe". The Guardian. Retrieved 10 July 2018. ^ "Classmates yearn for safe return of boys trapped in cave". Bangkok Post. Agence France-Presse. 2 July 2018. Retrieved 2 July 2018. ^ "Paper cranes of hope for Thai cave rescue". BBC News. Retrieved 16 July 2018. ^ "Families cling to hope as Thai cave rescue enters day seven". London Evening Standard. Archived from the original on 29 June 2018. ^ Dvorsky, George. "Former Navy Diver Dies in Thai Cave While Working to Rescue Trapped Boys". Gizmodo. Archived from the original on 9 July 2018. Retrieved 10 July 2018. ^ "Thais hold ceremony to appease cave goddess disturbed by soccer team's rescue". ABC News. 16 July 2018. Retrieved 16 July 2018. ^ "Chided in the West, cave-rescued coach is seen as saintly in Thailand". Public Radio International. Retrieved 19 July 2018. ^ CNN, Rebecca Wright and Hilary Clarke,. "British diver on Thai cave rescue: 'Are we heroes? No'". CNN. Retrieved 15 July 2018. ^ Sai, Philip Sherwell, Mae (15 July 2018). "Exclusive interview with Thai cave dive hero Vernon Unsworth: 'If the Brits hadn't been called in, it would have been too late'". The Sunday Times. ISSN 0956-1382. Retrieved 15 July 2018. ^ a b Parry, Richard Lloyd (14 July 2018). "Thai cave rescue: calm voice of coach helped boys to beat despair in the darkness". The Times. ISSN 0140-0460. Retrieved 15 July 2018. ^ Massola, James (9 July 2018). "'He's the one I trust': Coach praised as 'real hero' in Thai cave saga". The Sydney Morning Herald. Retrieved 15 July 2018. ^ Agencies (11 July 2018). "Coach Ekkapol, the unlikely stateless hero of Thai cave drama". The Straits Times. Retrieved 15 July 2018. ^ "Father of youngest Thai cave survivor describes how boys became trapped, coach's response". Retrieved 15 July 2018. ^ Premack, Rachel (10 July 2018). "Meet the 25-year-old coach of the Thai soccer team who was trapped in a cave for 17 days — here's what could happen to him now that they've all been rescued". Business Insider. ^ Bacon, John (5 July 2018). "'Hero or zero? ': Thailand abuzz over coach who led boys into cave – then kept them alive". USA Today. ^ Thepgumpanat, Panarat; Niyomyat, Aukkarapon (6 July 2018). "Thailand's trapped boys: careless or courageous?". Reuters. ^ "Thailand cave rescue" (Press release). Department of Foreign Affairs and Trade. 12 July 2018. Retrieved 19 July 2018. ^ Minister for Defence Marise Payne (11 July 2018). "Thailand cave rescue operation" (Press release). Department of Defence. Retrieved 19 July 2018. ^ a b "Thai cave rescue: International team deployed to aid massive search and rescue effort". The Straits Times. 3 July 2018. Retrieved 13 July 2018. 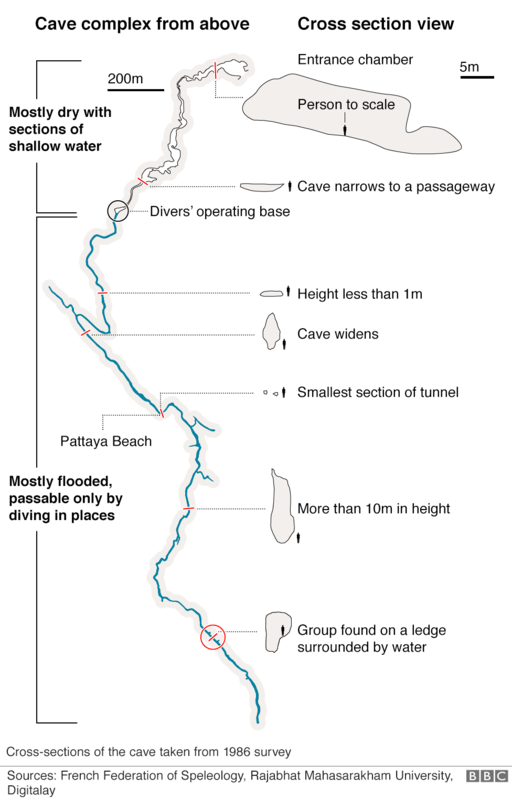 ^ a b "Cave rescue: The divers who got the Thai boys out". BBC. 10 July 2018. Retrieved 13 July 2018. ^ "Thailand Cave Rescue Efforts Pick up Pace as Flooding Eases". VOA. Associated Press. 30 June 2018. Retrieved 5 August 2018. ^ Kft., Webra International (4 July 2018). "The Visegrad Group: the Czech Republic, Hungary, Poland and Slovakia – Babis offers help in rescuing Thai boys from flooded cave". visegradgroup.eu. Archived from the original on 7 July 2018. Retrieved 6 July 2018. ^ "Bahno, 35 stupňů, ostré jeskyně. Čeští hasiči popsali záchranu thajských chlapců". Retrieved 28 October 2018. ^ "Finnish diver helping Thai rescuers says possible crack in cave may save boys". YLE. 4 July 2018. Retrieved 5 July 2018. ^ coconutsbangkok (5 July 2018). "French diver explains difficulties ahead as trapped team faces 'race against water' | Coconuts Bangkok". Coconuts. Retrieved 4 April 2019. 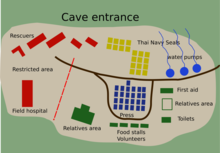 ^ "A summary of the Tham Luang Rescue | Caves & Caving in Thailand". www.thailandcaves.shepton.org.uk. Retrieved 4 April 2019. ^ "Life 'back to normal' for Thai cave rescuer who lives in Clare". Irish Times. 18 July 2018. Retrieved 31 January 2019. ^ "Rescue from Thai cave: Indian firm experts pitch in with tech support". 11 July 2018. ^ "Israeli technology to the rescue for cave-trapped Thai boys". The Jerusalem Post. 6 July 2018. Retrieved 13 July 2018. ^ "Thai cave rescue: Farmers happy even though fields ruined to help clear exit for trapped boys". news.com.au. 5 July 2018. Retrieved 13 July 2018. ^ "ซาบซึ้งน้ำใจ ลาวส่งทีมกู้ภัยช่วยเด็กติดถ้ำ ในถ้ำหลวงเชียงราย". ไทยรัฐออนไลน์. 27 June 2018. ^ "ภารกิจถ้ำหลวง: รู้จักทีมกู้ภัยนานาชาติที่มาช่วยค้นหาทีมฟุตบอลหมูป่าอะคาเดมี". BBC News. Retrieved 13 July 2018. ^ "บ้านเมือง - สถานทูตสหรัฐแถลงการณ์ห่วง 13 ชีวิตติดถ้ำหลวง". Banmuang.co.th. Retrieved 13 July 2018. ^ "МЧС готово помочь в спасении заблокированных в пещере в Таиланде школьников". RT на русском (in Russian). Retrieved 4 April 2019. ^ "Вода продолжает прибывать в пещеру, где застряли дети". vesti.ru. Archived from the original on 5 July 2018. Retrieved 4 July 2018. ^ "МЧС готово помочь в спасении заблокированных в пещере в Таиланде школьников". RT на русском (in Russian). Retrieved 5 July 2018. ^ "Further deployment of British cave rescue divers to Thailand". British Cave Rescue Council. Retrieved 13 July 2018. ^ "Luang Nang Non – Cave Rescue Incident". British Cave Rescue Council. Retrieved 13 July 2018. ^ "Further progress on the rescue operation to bring the boys out of Tham Luang Nang Non Cave". British Cave Rescue Council. Retrieved 13 July 2018. ^ a b Oliphant, Roland; Horton, Helena (9 July 2018). "Meet the seven British divers playing leading roles in the Thai cave rescue mission". The Telegraph. ISSN 0307-1235. Retrieved 12 July 2018. ^ "Key questions on Thai cave rescue". BBC News. 12 July 2018. Retrieved 12 July 2018. ^ "Tham Luang Nang Non Cave, Thailand – BCRC Update2". British Cave Rescue Council. Retrieved 13 July 2018. ^ "The Brits behind the Thai cave boys search". BBC News. 3 July 2018. Retrieved 13 July 2018. ^ "Cave boys rescue diver 'not a hero'". BBC News. 13 July 2018. Retrieved 13 July 2018. ^ "Tham Luang Nang Non Cave, Thailand – Supplement". British Cave Rescue Council. Retrieved 13 July 2018. ^ Lunn, Rosemary E. "Cave divers Mallinson and Jewel fly out to Thailand". X-Ray Magazine. Archived from the original on 5 July 2018. Retrieved 6 July 2018. ^ Lunn, Rosemary E. "Two more Brit cave rescuers fly to Thailand today". X-Ray Magazine. Archived from the original on 6 July 2018. Retrieved 6 July 2018. ^ Horton, Helena; Lowe, Yohannes (13 July 2018). "British diver describes 'electric' feeling after rescuing trapped Thai boys from cave". The Telegraph. ISSN 0307-1235. Retrieved 13 July 2018. ^ "How the U.S. Military Helped Support the Thai Cave Rescue". Popular Mechanics. 12 July 2018. Retrieved 13 July 2018. ^ "Throng of volunteers gather to rescue Thai boys trapped in cave". Reuters. 6 July 2018. Retrieved 8 July 2018. ^ "МЧС готово помочь в спасении заблокированных в пещере в Таиланде школьников". RT на русском (in Russian). Archived from the original on 5 July 2018. Retrieved 5 July 2018. ^ Yusof, Zaihan (12 July 2018). "Thai cave rescue: Singaporean diver who took part in risky operation says it was 'touch and go'". The Straits Times. Retrieved 13 July 2018. ^ "El buzo español que participó en el rescate de Tailandia" (in Spanish). El Pais. 12 July 2018. Retrieved 12 July 2018. ^ "ผู้ว่าฯ สั่งเดินหน้าพร่องน้ำถ้ำหลวงคืนนี้ นักประดาน้ำทีมสวีเดนถึงเชียงรายแล้ว" (in Thai). MGR Online. 25 June 2018. Archived from the original on 3 July 2018. Retrieved 4 July 2018. ^ "Порятунок дітей у затопленій печері в Таїланді: в операції брав участь дайвер з України". hromadske.ua (in Ukrainian). Retrieved 6 July 2018. ^ "French team ready to join cave rescue – if Thailand asks". khaosodenglish.com. 7 July 2018. Archived from the original on 7 July 2018. Retrieved 8 July 2018. ^ Lyons, Kate (11 July 2018). "'The Great Escape': newspapers around the world share joy of Thai cave rescue". The Guardian. Retrieved 11 July 2018. ^ Jordan, Dearbail (6 July 2018). "Elon Musk offers to help Thai cave rescue". BBC News. Retrieved 25 October 2018. ^ Glaser, April. "Elon Musk Is Trying to Aid the Thai Cave Rescue by Sending His Engineers and Brainstorming on Twitter". Slate. Archived from the original on 7 July 2018. Retrieved 8 July 2018. ^ "Elon Musk says SpaceX is building a 'kid-sized submarine' to rescue trapped soccer team". The Verge. Archived from the original on 8 July 2018. Retrieved 8 July 2018. ^ "Thai cave rescue: Elon Musk delivers tiny submarine, rescuers say no thanks". ABC News. 10 July 2018. Archived from the original on 10 July 2018. Retrieved 10 July 2018. ^ Rawlinson, Kevin (10 July 2018). "Elon Musk queries expertise of Thai cave rescue officials". The Guardian. Retrieved 16 July 2018. ^ "Thai cave rescue: FIFA president Gianni Infantino invites boys to World Cup final". Goal.com. Archived from the original on 7 July 2018. Retrieved 7 July 2018. ^ "Thai cave rescue: 2 boys may have pneumonia, says health official". Channel NewsAsia. Archived from the original on 10 July 2018. Retrieved 10 July 2018. ^ "Thai cave rescue: Fifa, Man Utd & Kyle Walker offer support to young players". BBC. 10 July 2018. Retrieved 10 July 2018. ^ "Boy's football team rescued from Thailand cave get invite from Manchester United and touching offer from England star Kyle Walker". Talksport.com. 6 July 2018. Retrieved 13 July 2018. ^ "Thai cave boys watch Man United v Everton". Washington Post. Retrieved 28 October 2018. ^ "Thai cave boys to watch Manchester United v Everton at Old Trafford". 28 October 2018. Retrieved 28 October 2018 – via www.bbc.co.uk. ^ "Buenos Aires 2018 Youth Olympics kicks off in history-making ceremony". Xinhua News Agency. 7 October 2018. Retrieved 17 November 2018. ^ a b c d e f g h i j k l m n o "Thai cave rescue: a timeline". Yahoo!. 8 July 2018. Archived from the original on 8 July 2018. Retrieved 9 July 2018. ^ a b Vejpongsa, Tassanee (18 June 2018). "Thai rescuers search for other entrances to flooded cave". The Washington Post. Archived from the original on 9 July 2018. Retrieved 9 July 2018. ^ News, A. B. C. (16 July 2018). "'Superman' doctor who cared for soccer team in cave reunites with boys in hospital". ABC News. Retrieved 17 July 2018. ^ "Hollywood wants in on Thai cave story drama". Ballina Shire Advocate. Retrieved 16 July 2018. ^ May, Ashley (6 July 2018). "Who was the former Thai Navy SEAL who died during cave rescue operations to save soccer team?". USA Today. Archived from the original on 6 July 2018. Retrieved 9 July 2018. ^ "Thailand cave rescue: Mission to save boys under way". BBC World News. Archived from the original on 8 July 2018. Retrieved 8 July 2018. ^ "Thai Cave Rescue Live Updates: 8th Person Is Out". The New York Times. 9 July 2018. Retrieved 9 July 2018. ^ Davidson, Tom. "Thailand cave rescue live: Mission to free remaining four boys and football coach "could take days" because of weather". Daily Mirror. Archived from the original on 9 July 2018. Retrieved 9 July 2018. ^ a b Staff (10 July 2018). "Thailand cave rescue: all 12 boys and coach successfully rescued – live – Last three Thai navy divers and medic have also left cave, ending perilous operation in northern Thailand – 10:49 am/et/usa". The Guardian. Archived from the original on 10 July 2018. Retrieved 10 July 2018. ^ "Thailand Cave rescue: All divers are now out of the cave". BBC News. 10 July 2018. Retrieved 10 July 2018 – via YouTube. ^ Wongcha-um, Panu. "Thailand's Tham Luang cave to become museum to showcase boys' rescue". Reuters. Retrieved 11 July 2018. ^ Hutchinson, Bill. "With all odds against them, here's how rescuers pulled off 'miracle' Thai cave mission". ABC News. Retrieved 12 July 2018. ^ Brown, Ruth (9 July 2018). "Popular Thai governor fired, but keeps cave rescue gig". New York Post. Retrieved 13 July 2018. ^ "Thailand's Navy SEALs Will Add Cave-Diving to Their Training". Time. Retrieved 13 July 2018. ^ "What's Next For The Rescued Thai Soccer Team?". Fortune. Retrieved 13 July 2018. ^ Maresca, Thomas (10 July 2018). "Out of the cave, onto the big screen: Hollywood has its sights on gripping Thai rescue". CNBC. Retrieved 11 July 2018. ^ McNary, Dave (12 July 2018). "Second Thai Cave Rescue Movie in the Works". Variety. Retrieved 12 July 2018. ^ Cheung, Helier (25 December 2018). "A sneak peek at the first Thai cave rescue film". BBC News. Retrieved 26 December 2018. ^ "Australian Honours" (PDF). Government Notices Gazette. Canberra: Commonwealth of Australia. 24 July 2018. ISSN 0819-7105. Retrieved 25 July 2018. ^ Zhou, Naaman (25 January 2019). "Australian of the year 2019: Thai cave rescue divers win rare joint award". The Guardian. Retrieved 25 January 2019. ^ "งานเลี้ยงแสดงความขอบคุณมูลนิธิ Beijing Peaceland และองค์กร Green Boat Emergency Rescue ในภารกิจสนับสนุนการช่วยเหลือเยาวชนทีมฟุตบอล ณ ถ้ำหลวง-ขุนน้ำนางนอน จ. เชียงราย". Royal Thai Embassy, Beijing (Press release) (in Thai). Retrieved 5 August 2018. ^ a b Thai NavySEAL (21 July 2018). "Letter of commendation". Retrieved 25 July 2018 – via Facebook. ^ "UK PM May hosts reception for the who rescued Thai children". Reuters. 25 July 2018. Retrieved 5 August 2018. ^ "BCRC Team attend a reception at No.10" (Press release). British Cave Rescue Council. 3 August 2018. Retrieved 5 August 2018. ^ "Cave boys claim life remains the same. His Majesty to confer about 200 decorations" (in Thai). Retrieved 24 October 2018. ^ ราชกิจจานุเบกษา (21 March 2019). "ประกาศสำนักนายกรัฐมนตรี เรื่อง พระราชทานเครื่องราชอิสริยาภรณ์อันเป็นที่สรรเสริญยิ่งดิเรกคุณาภรณ์ให้แก่บุคคลที่ช่วยเหลือผู้ประสบภัยในถ้ำหลวง วนอุทยานถ้ำหลวง-ขุนน้ำนางนอน จังหวัดเชียงราย" (PDF) (in Thai). Retrieved 22 March 2019. ^ "Displaying items by tag: 2018 - Pride of Britain Awards". Pride of Britain. Retrieved 6 November 2018. ^ "PADI Awards Medal of Valor to Thailand Cave Rescuers Representing Diving's Finest Hour". DiveNewswire. 31 October 2018. Retrieved 9 April 2019. ^ Lunn, Rosemary E (28 December 2018). "7 Medals and a Cave Dive - New Year's Honour Awards for the Thai Rescuers". X-Ray Magazine. Retrieved 28 December 2018. ^ Webster, Nick (5 January 2019). "Thai cave rescue boys to be Asian Cup guests of honour in UAE". The National. Wikimedia Commons has media related to 2018 Tham Luang cave rescue. "Tham Luang Cave Rescue: Against The Elements"